Rebound Sport 2000 Squash Court Paint has been developed and refined over several years to provide the optimum finish for gypsum and other budget squash court wall materials. While Rebound Squash Court Plaster is naturally white and doesn't need painting or protecting, other surfaces need a finish that will help reinforce the wall finish against the cracking, crumbling and abrasion that court walls are subject to during normal play. 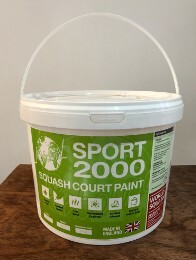 Rebound Sport 2000 Squash Court Paint has been formulated to provide a finish that is tough, durable, flexible and easy to clean, while providing excellent playability. Rebound Paint is supplied as a two part polymer mix which chemically bonds to the wall surface, so it will not peel when correctly applied. It is resistant to UV in sunlight, damp and mould, frost and even sea water. The finish is easy to clean and, due to its robust nature, lasts much longer than ordinary paint. It provides the ideal surface characteristics of consistency and playablity that have earned it certification from the World Squash Federation of use at the highest levels of the sport. There will come a time for any squash court when it is starting to show its age. After years of pounding, the court walls will at least need repainting. More serious problems may also be present. A new building can settle, causing small cracks to appear in the surface of court walls. Inferior materials, such as gypsum, will crack and may begin to crumble, particularly after intensive use that the material was simply not designed for. Refurbishment whilst maintaining WSF and England Squash specified dimensions can be difficult - the allowed tolerance is only 10mm. Adding standard chipboard (a 42mm thickness) or gypsum (around 15mm) is not an option. However, if the problems can be caught early, before the damage is too severe, Rebound Sport 2000 Squash Court Paint is flexible enough to fill in hairline cracks and provide surface protection to extend the useful life of a court.